This year Valley Heights has included its first Robotics class for juniors and seniors. In the Robotics class students do more than just build robots they have to learn the programing with the software they the school has provided. The class doesn’t just build robots for fun, they take their best ones to competitions that they travel to. Millie Laughlin is the Robotics teacher who with the assistance of Alex Hardin, Senior, peer mentor. 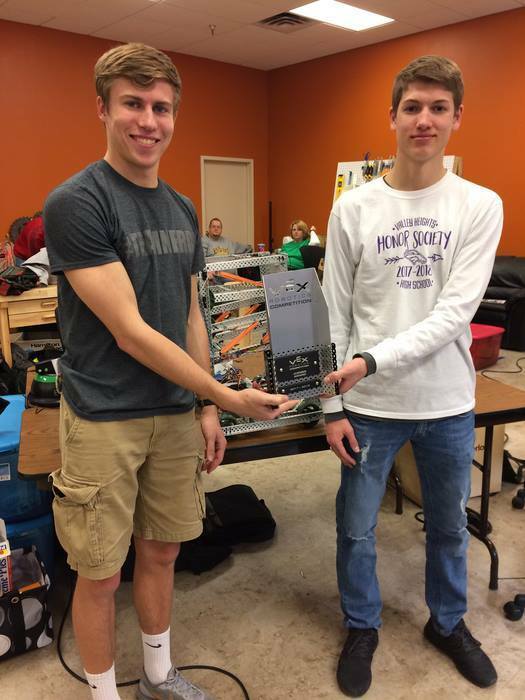 In Robotics there’s a competitive team of two people, Conner Nolte, Junior, and Alex, who team up and work on the robots together. Robots can be controlled with two people or one but each way is kinda difficult if you have two people controlling one robot then one will move the wheels and one the claw and arm and this can be very difficult if the two people are not in sink. One person can also be quite difficult because then you have more things to do and focus on the you would with two people. The team rarely builds completely new robots, they usually just tweak the previously used ones to make them better. “For the Robotics class you have to think on your feet and you have to keep pushing for your goals.” said Laughlin. Being in Robotics takes hard work and effort to get where the students are today. People from all over the world go to the competitions to compete for the trophy. The Robotics team success has caught the attention of a lot of students who were told about the class and are now showing interest to join.